For our third (but still not final!) 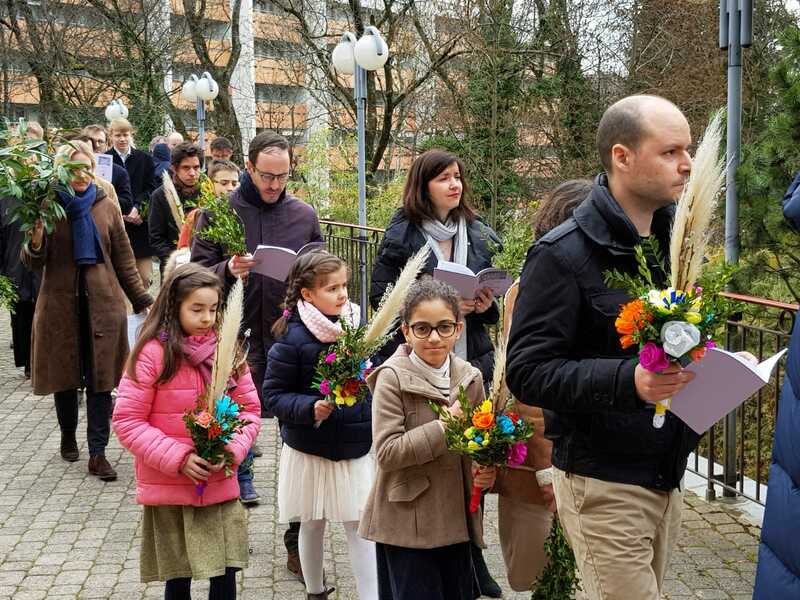 Palm Sunday photopost, we start with two examples of the ceremony celebrated according to surviving medieval Uses. 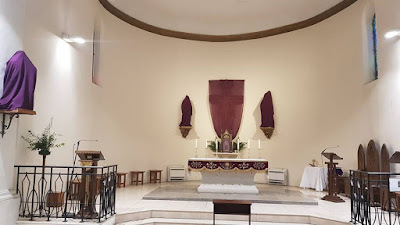 The first was done at the church of St Joseph in Troy, New York, by members of the Calced Carmelite Order, which preserved its ancient Use after the Council of Trent. 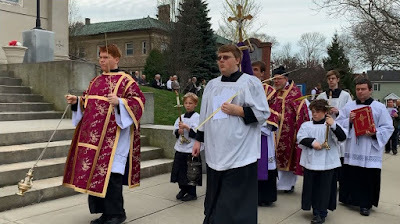 The second was at Holy Name in Providence, Rhode Island, where Palm Sunday is traditionally celebrated according to the proper liturgical Use of the See of Braga. (For a more detailed explanation, see this post from last year, which explains why, and gives details of the ceremony.) We also have two celebrations in the Byzantine Rite, and a video of the complete ceremony from the Basilique Notre-Dame in Fribourg, Switzerland, staffed by the priests of the FSSP’s generalate house, which has a really remarkable choir. 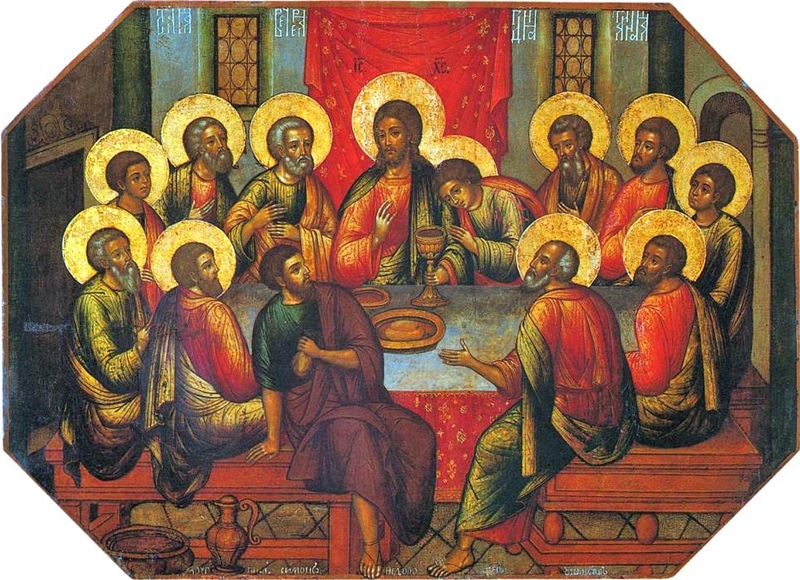 In the Byzantine Rite, these words are sung at the Divine Liturgy of Holy Thursday in place of the Cherubic Hymn, and at the distribution of Communion, when they may be repeated several times. These are the Greek and Old Church Slavonic versions; the traditional Slavonic music is particularly beautiful. 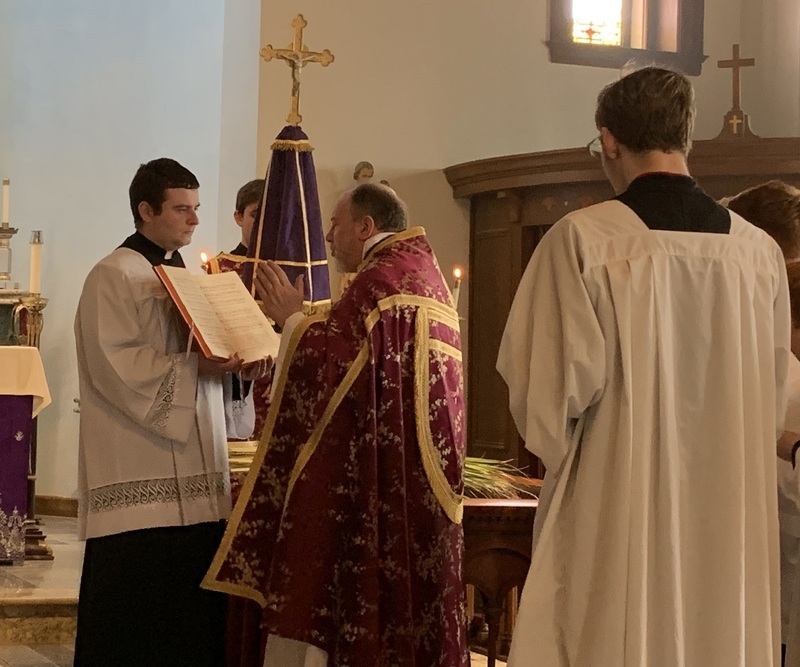 As we do every year, we will have a whole series of photoposts of your Holy Week liturgies, with individual posts for Tenebrae, Holy Thursday, Good Friday, Holy Saturday, and Easter Sunday. As always, we are glad to receive images of the OF, EF, Eastern Rites, the Ordinariate Use, etc., including any part of the liturgy. 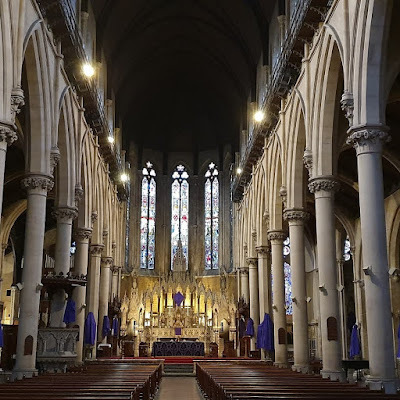 Please send your photographs to photopost@newliturgicalmovement.org, and remember to include the name and location of the church, along with any other information you think important. Please read this! 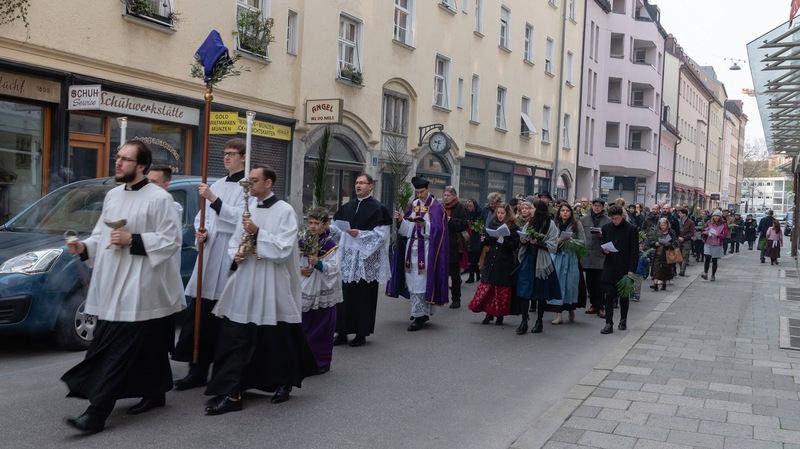 – Last year, the total number of photographs we published of the ceremonies from Palm Sunday to Easter was over 650, spread out over 15 posts. This is, of course, all to the good, but I would ask people to do a few things to make it easier for us to process the photos. The first is to size them down so that the smaller dimension is around 1500 pixels. The second is to send the pictures as zipped files, which are a lot easier to process, (not links, and not as photos attached to an email). 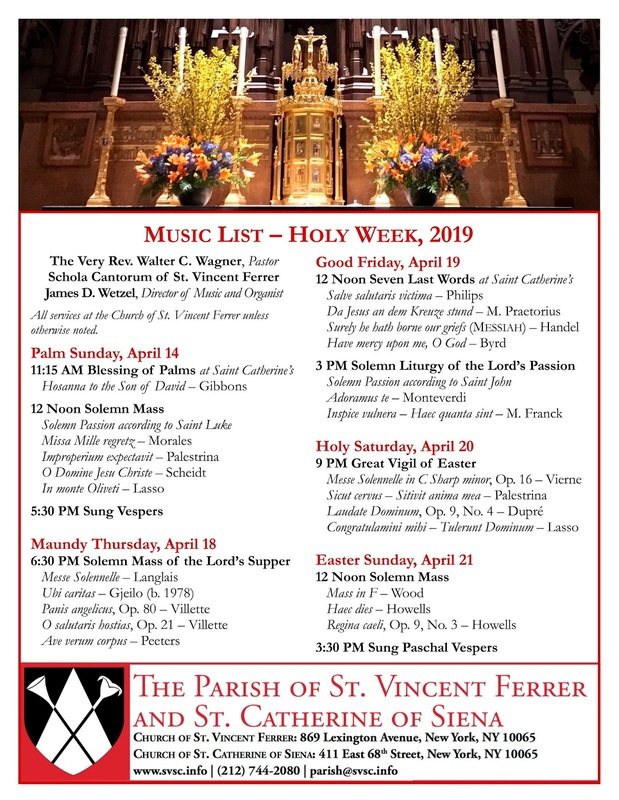 The third is to not mix photos of one ceremony with those of another, and to put the name of the ceremony (“Tenebrae”, “Holy Thursday”, “Good Friday”, “Holy Saturday”, and “Easter Sunday”) as the subject of the email. Your help is very much appreciated. Here are just a few highlights from last year’s photoposts. 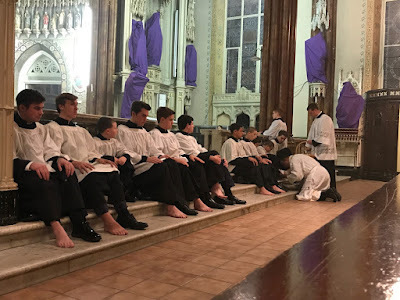 From the second Holy Thursday post: the Mandatum at the National Shrine of St Alphonsus Liguori in Baltimore, Maryland (FSSP), celebrated with the altar servers. 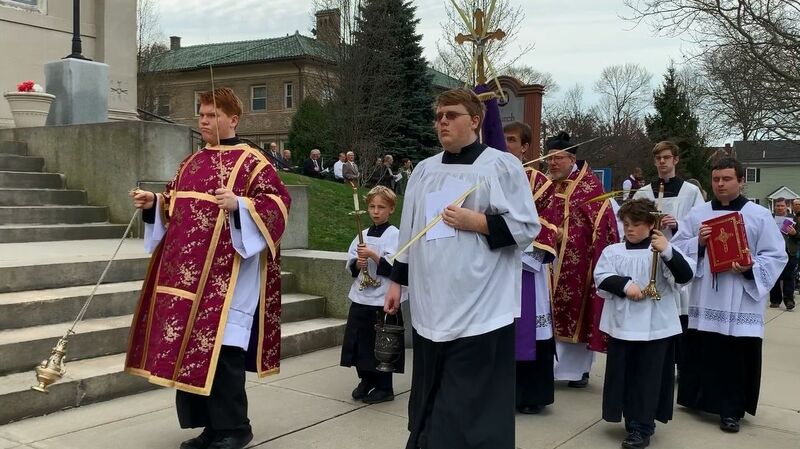 From the third Good Friday post: the Procession during the Mass of the Presanctified at St Joseph’s Oratory in Detroit, Michigan (ICKSP). From the Tenebrae post: Holy Innocents in New York City. 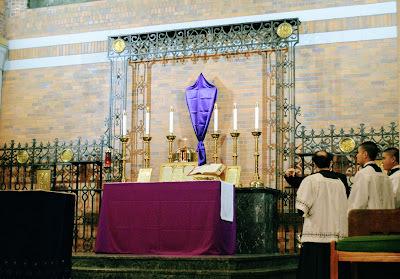 From the first Holy Saturday post: the triple candlestick at Mater Ecclesiae in Berlin, New Jersey. From the Easter Sunday post: a subdeacon sings the Epistle, standing in front of the icon of the Resurrection, at St Peter Eastern Catholic Church in Ukiah, California. 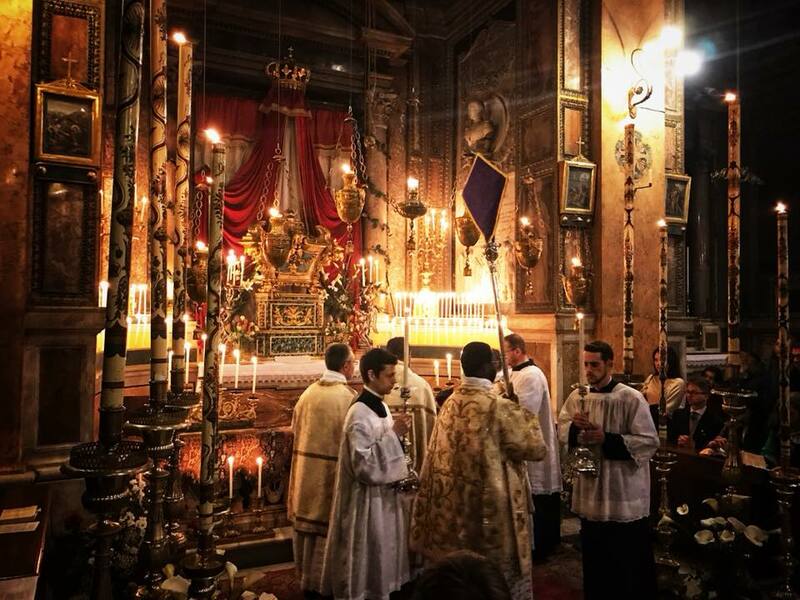 Before we begin the solemn rites of the Triduum, we have to finish up our series of pictures of the Lenten station churches in Rome, which our favorite Roman pilgrim, Agnese Bazzuchi, has so kindly shared with our readers for several years in a row. Grazie mille, carissima! 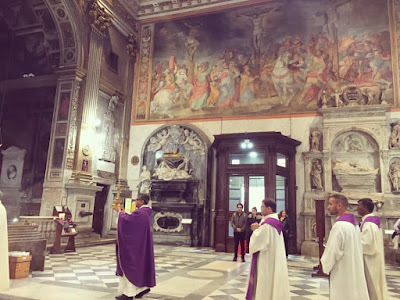 This church is dedicated to a Pope who was martyred in the early 4th century, Marcellus I, built over the filthy stables where he was condemned to labor by the Emperor Maxentius; his relics are under the high altar. The church burned down in 1519, and was rebuilt in the opposite orientation from that of the original structure. This church has the peculiar name of “Round St Stephen’s” because it was the only round church built in Rome in antiquity. (The Pantheon is also round, and as a church was also known as “Round St Mary’s”, but was not of course originally built as a church.) The building originally had three rings, but the outermost was removed in a 12th-century restoration. 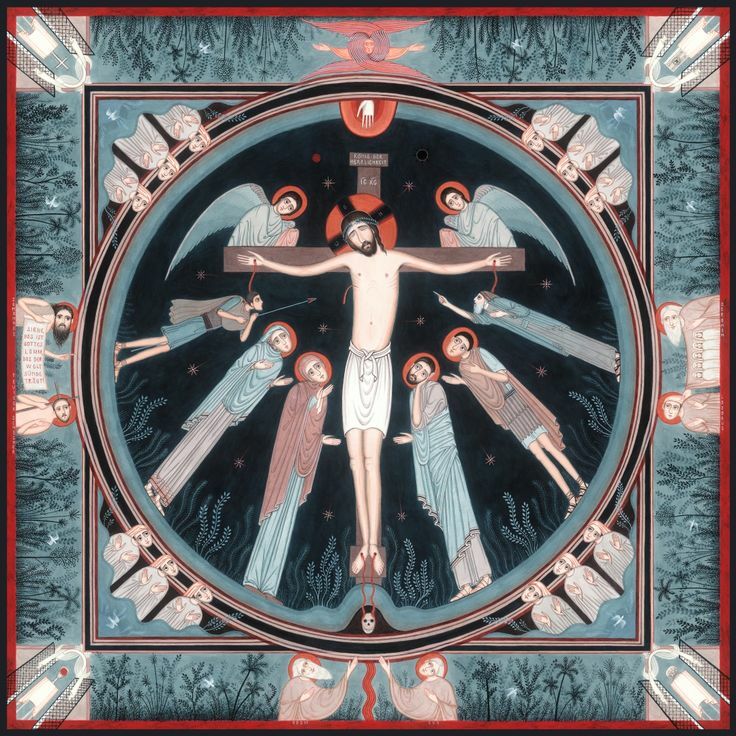 The sacred Triduum is almost upon us, and we will be making a request for photos of the ceremonies of those days very soon. We continue with our Palm Sunday series, which will probably get up to four separate posts like last year. As always, our thanks to everyone who sent these in - evangelize though beauty! 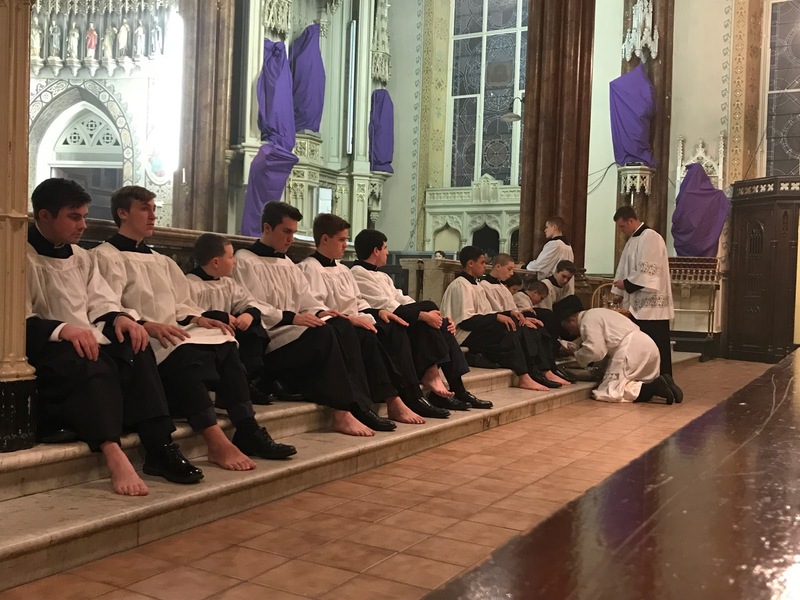 The parish of St Vincent Ferrer and St Catherine of Siena in the Archdiocese of New York is served by the Dominican Friars of the Province of Saint Joseph. The church of Saint Vincent Ferrer was built in 1918 to the designs of renowned Gothic revival architect Bertram Goodhue, who considered this his finest building. Now recognized as a National Historic Landmark, it includes a complete set of Charles Connick stained glass windows, carvings by Lee Lawrie, and two instruments by the Schantz Organ Company. 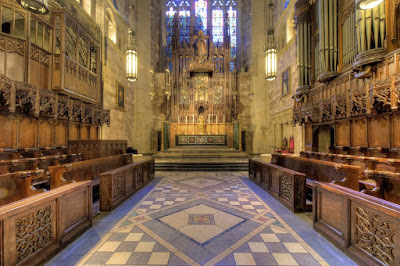 The church is located at 869 Lexington Avenue in Manhattan; the church of St Catherine of Siena is located at 411 East 68th St. 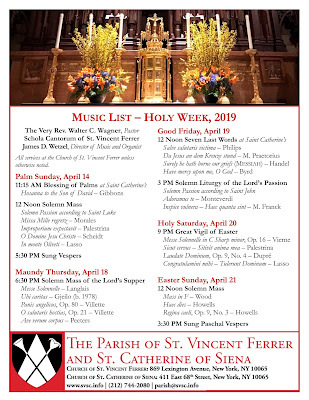 The Schola Cantorum of Saint Vincent Ferrer, the parish’s professional choral ensemble, sings the Sunday Solemn Mass at noon, (Ordinary Form), and for weekday feasts during its season, which runs from September through Corpus Christi; it is lead by Director of Music and Organist James D. Wetzel. 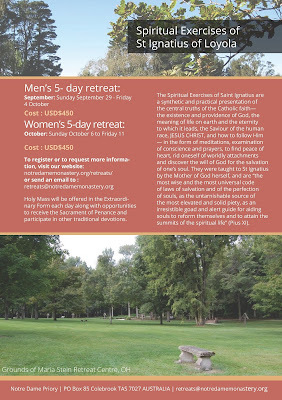 For more information, including a music list of this year’s repertoire, visit www.svsc.info/music. 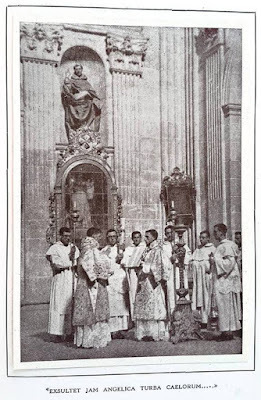 Since major changes were made to the liturgy of the Triduum in the Roman Rite in the 1950s, it seemed that during this Holy Week readers might be interested in how those changes affected the Dominican Rite Triduum even more profoundly. As most readers know, the old Easter Vigil of the Roman Rite underwent a series of reforms beginning in 1951, and continuing until the introduction of the revised Holy Week Rite of Pope Pius XII in the spring of 1956. The Dominicans imitated these changes as much as possible until we produced a new vigil of our own, one that went into effect at Easter 1957. 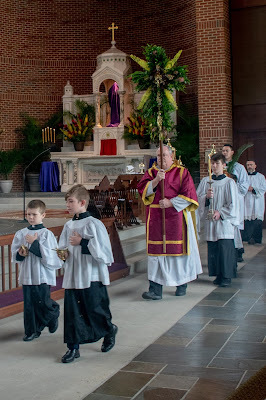 Readers who know the vigil of the 1962 Roman Missal would find that in use by Dominicans from 1957 onward virtually identical to it, so I will not describe it here. 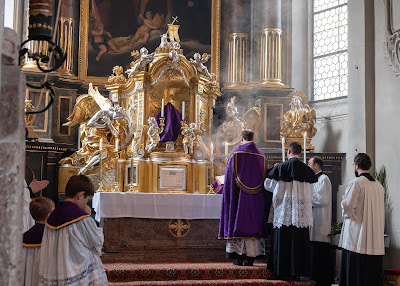 But as our older form of liturgy is quite different and of historical interest. 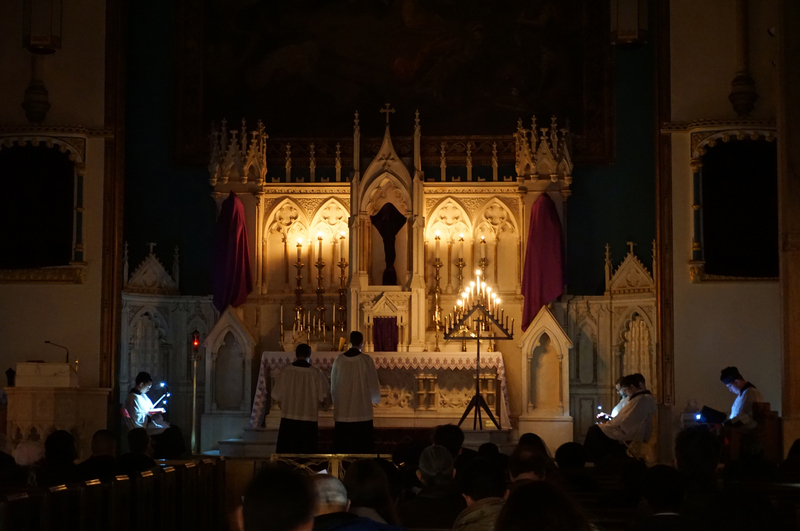 Following the medieval practice of Saturday afternoon celebration of the Easter Vigil, the Dominican vigil began after the singing of None. 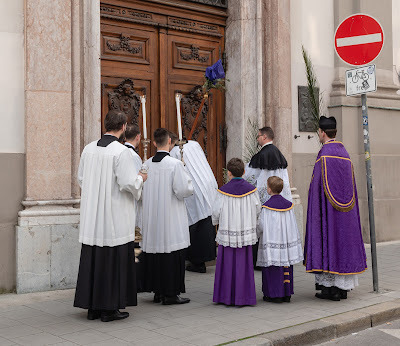 In the modern period, when the Vigil had migrated to Saturday morning, this meant that Matins and the four Minor Hours of Holy Saturday were sung back-to-back in the morning, so that the vigil itself could begin before 9:00 a.m. One of the first effects of Pope Pius XII’s period of experimentation after 1951 was that in some houses, the Minor Hours of Holy Saturday were restored to their normal times, and the Vigil was celebrated in the later afternoon, but this was by no means the universal practice. Morning celebration continued in many places until 1957. 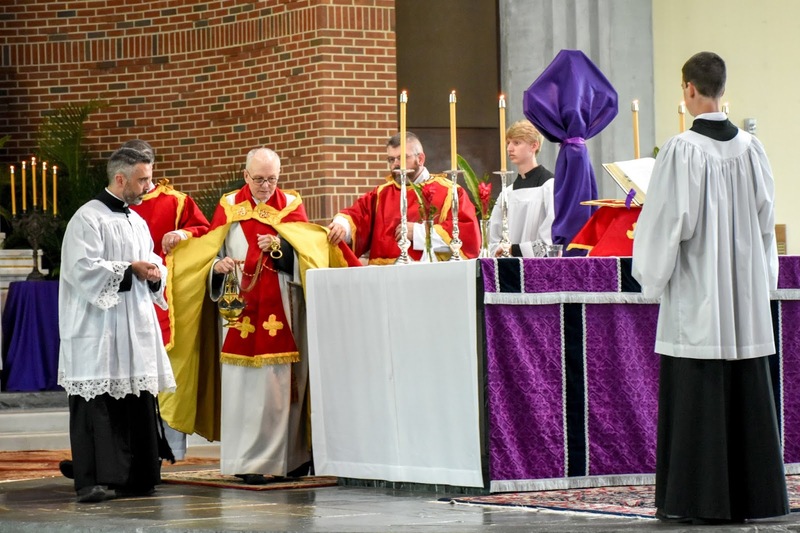 The old Dominican vigil began with the blessing of the new fire. 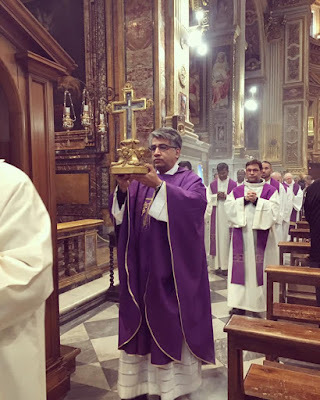 The prior or another priest celebrant, in white cope, standing before the high altar, blessed lighted coals in a small metal dish held by the sacristan. 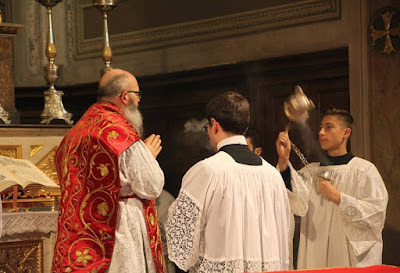 (The coals were lighted without any special ceremony in the sacristry before the service.) The deacon held the missal. 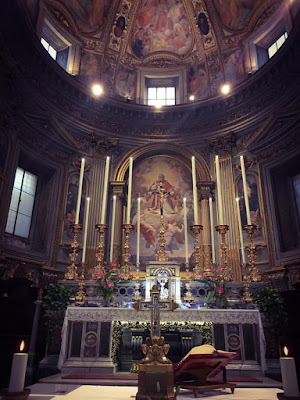 The blessing prayer Domine sancte Pater was short and merely recited, not sung. 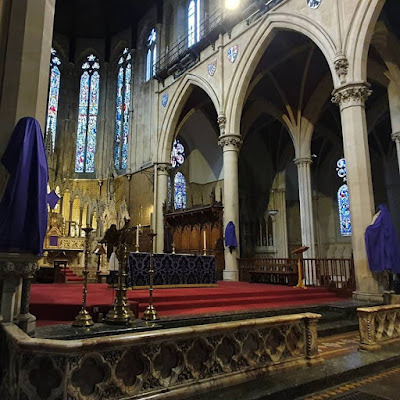 A small candle was then lighted from these coals, which were kept in the presbytery until the lighting of the church lamps, so that they could be used to relight the Easter Candle should a draft put it out. 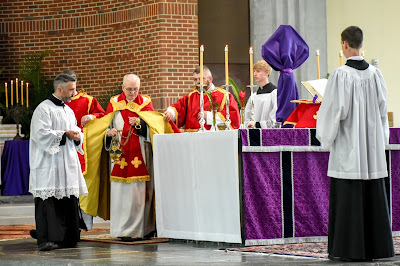 The deacon received the prior’s blessing, gave the subdeacon the missal and placed himself to the subdeacon’s left, (the Gospel side, as all were facing the altar.) 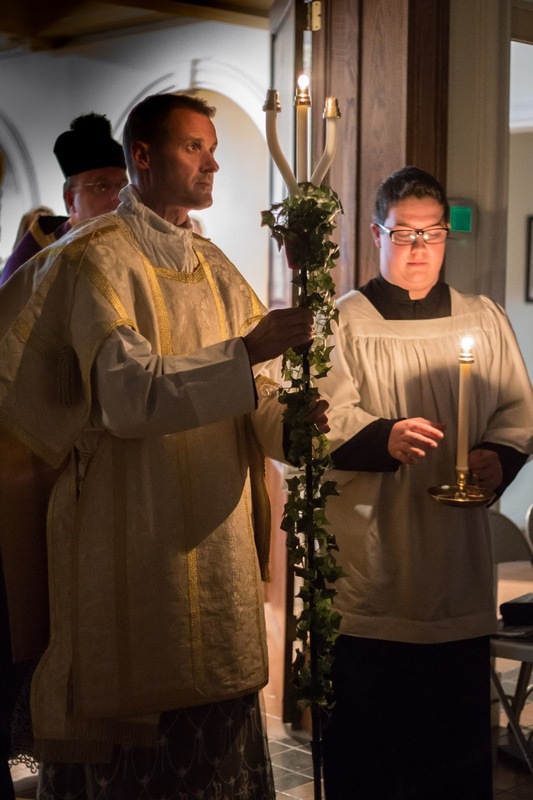 Two acolytes with unlighted candles flanked the deacon and subdeacon. 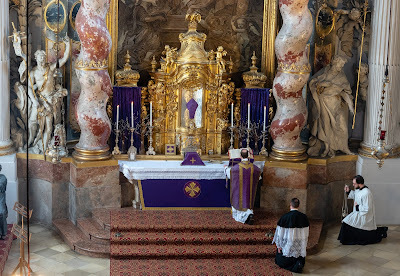 The prior took his place at the Epistle side of the altar, as he did for the singing of the Gospel at Solemn Mass. 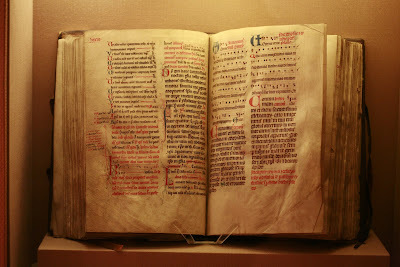 The deacon then sang the Exultet, for which the Dominicans have a tone somewhat different from the Roman, and which differs in a number of places from the Roman text. 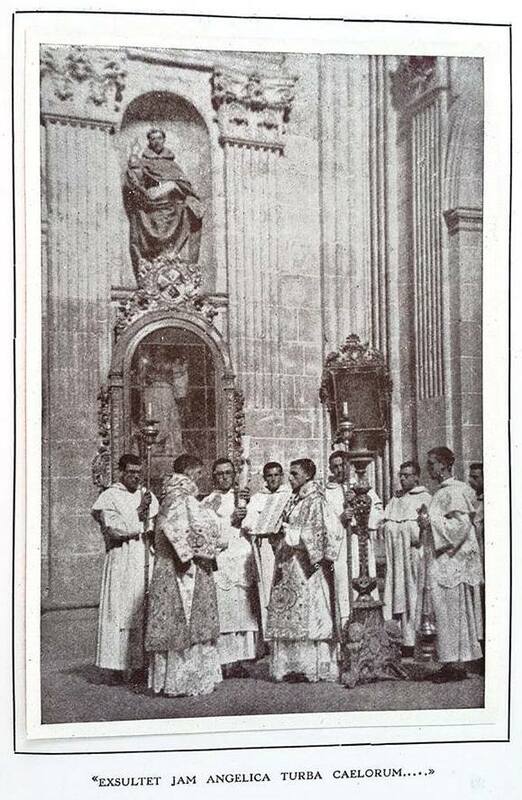 Although in modern times Dominicans used Easter candles of conventional size, as late as the 1800s we often used very large ones, much taller than those in use today. Our province archives have pictures from the 1850s of one of these candles at our old priory church in Benicia, California. (I will try to get a scan of it.) Dominicans did not use a three-branch holder for the Easter fire, and there was no chanting of Lumen Christi. In many priories, the ancient practice of the “Easter Card” (Cartula Paschalis) was maintained into the last century; this was tacked to the candle in place of the modern practice of putting letters on the candle. 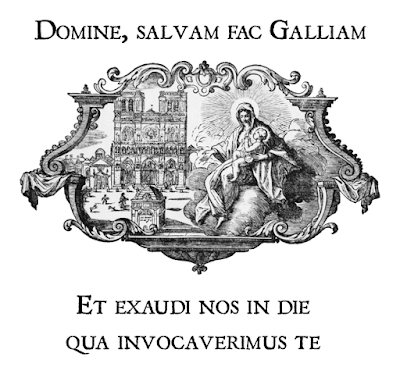 The card gave the year of the Lord, the years since the foundation of the Order, and since the death of St. Dominic, the Epact, the Dominical letter, and the Indiction. When the deacon reached the words In huius igitur noctis, he inserted the first grain of incense into the candle; at the words Rutilans ignis accendit, he lit the Paschal candle. The server holding the other four grains of incense then inserted them as the deacon continued to sing the blessing. These acts would have required use of a ladder in the old days. 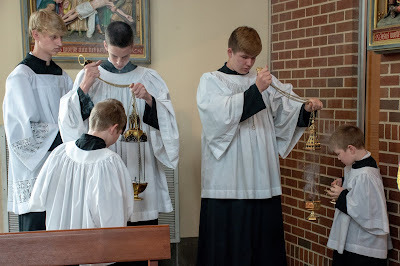 As the deacon sang Qui licit sit divisus in partes, the two acolytes’ candles were lighted, and then, at Pretiosae huius lampadis, the church lamps. 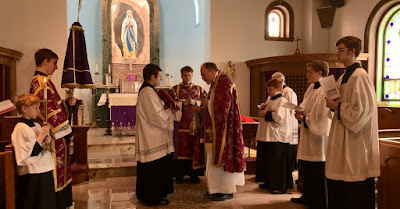 When the Exultet was finished, the ministers returned to the sacristy, put on white Mass vestments and returned to the altar. There they bowed and went to be seated for the readings, without any other ceremony. During this one Mass of the year, the acolytes’ candles were not snuffed when not in use, but allowed to burn continuously. A lector in surplice then sang the four readings of vigil: Genesis 1, 1 -2, 2; Exodus 14, 24-31; Isaiah 4, 1-6; and Isaiah 54, 17 - 55, 11. In the thirteenth-century the number of readings at the vigil varied widely, from 4 to 18. The Dominican shorter version was found widely in use in Italy; there is actually nothing unusual about it, so I do not believe that it was a special model for the post-1955 Roman revision of the Vigil, since the readings do not match exactly. I would think that the Roman model was one of the shorter Italian (Roman) uses from the middle ages. A Tract and Collect followed each reading except that from Genesis, which had only a Collect. The second reading from Isaiah had two collects, one before and one after the Tract Sicut Cervus. Two chanters wearing surplices in medio chori then lead the community in singing the Litany of the Saints in its Dominican form. 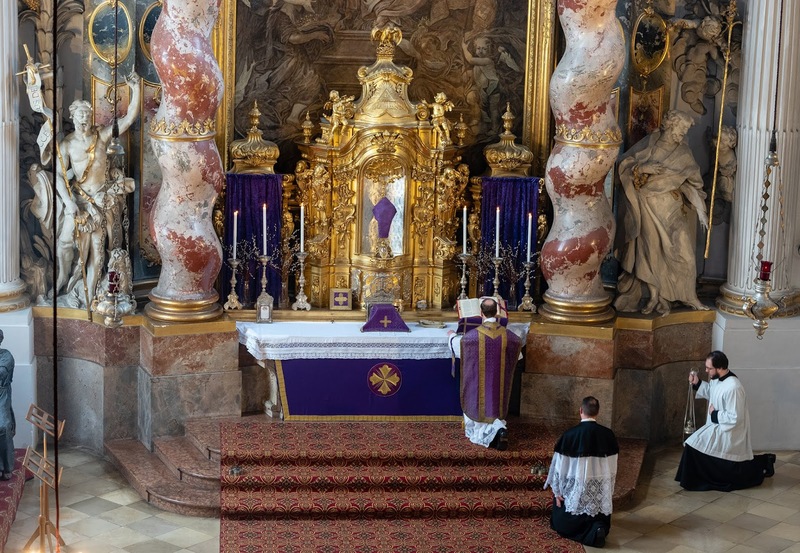 When the choir had sung the last Agnus Dei of the Litany, the choir began the Easter Kyrie, and the major ministers approached the altar for the prayers at the foot of the altar. 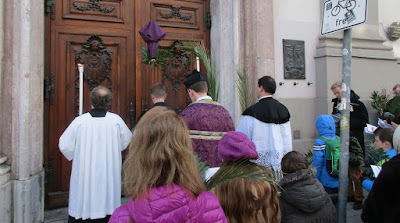 At the center of the altar, the priest intoned the Gloria in the solemn tone, very similar to that of Roman Mass IV; as it was intoned, the organ played for the first time since the beginning of Lent, the church bells were rung for the first time since Holy Thursday, and the friars took off their black cappas to reveal their white habits. The subdeacon then sang the Epistle from Colossians 3. 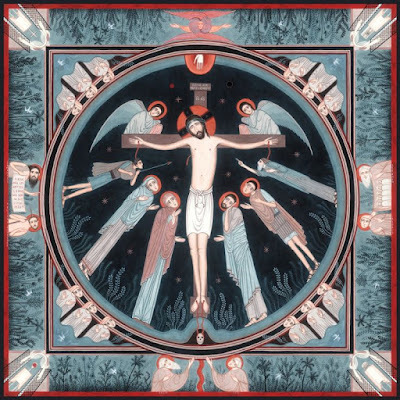 The Dominican way of singing the Easter Alleluia before the Gospel differs from the common Roman form, with its three repetitions of the Alleluia and cantors raising each intonation. To the right you can see the Easter Alleluia according to the Domincan chant, the melody of which differs a bit from the common Roman form. You can also see how it is sung. 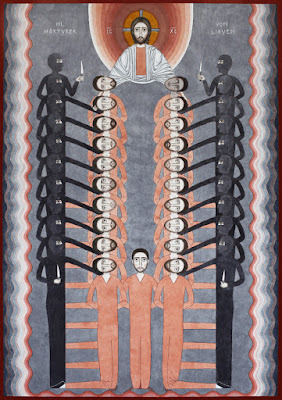 Two cantors in medio chori intone it and the friars all rise. The community then joins in on the short melisma at the end: as indicated by the double bar. Note that this use of the double bar in Dominican notation functions as does the asterisk in Solesmes notation. 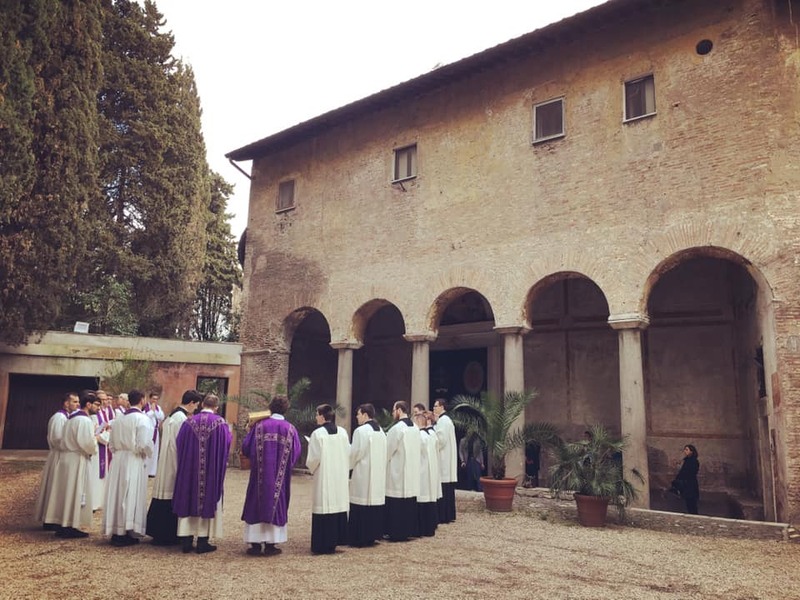 Then the entire Alleluia is repeated by all, as indicated by the word “Repet(itur)” The friars then sit while the two cantors sing the verse, joining in for eius at the end, again, as indicated by the double bar before that word. 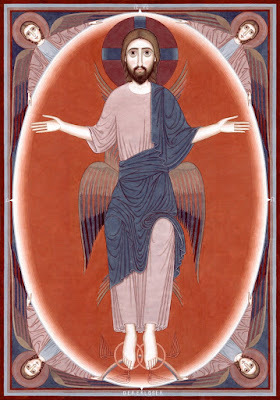 As can be seen from “Non repet(itur) Alleluia”, the Alleluia is not repeated after the verse. 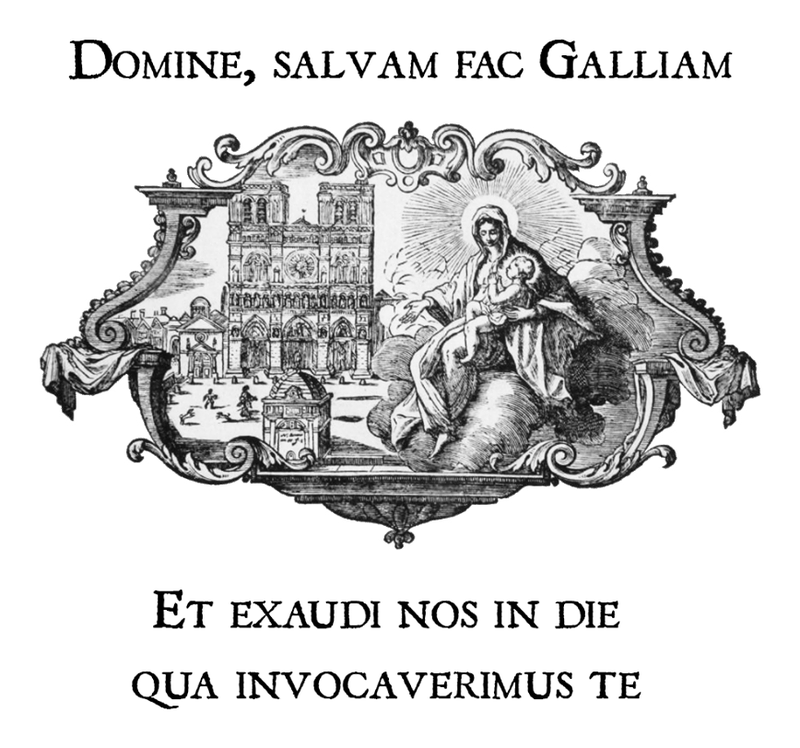 The Dominican practice is to repeat the Alleluia only once, before the verse. Originally we sang the Alleluia once more after the verse, as I will explain below. Another pair of cantors next joined the original two to sing, antiphonally, the Tract (Ps. 116), after which the deacon chanted the Gospel from Matthew 28. 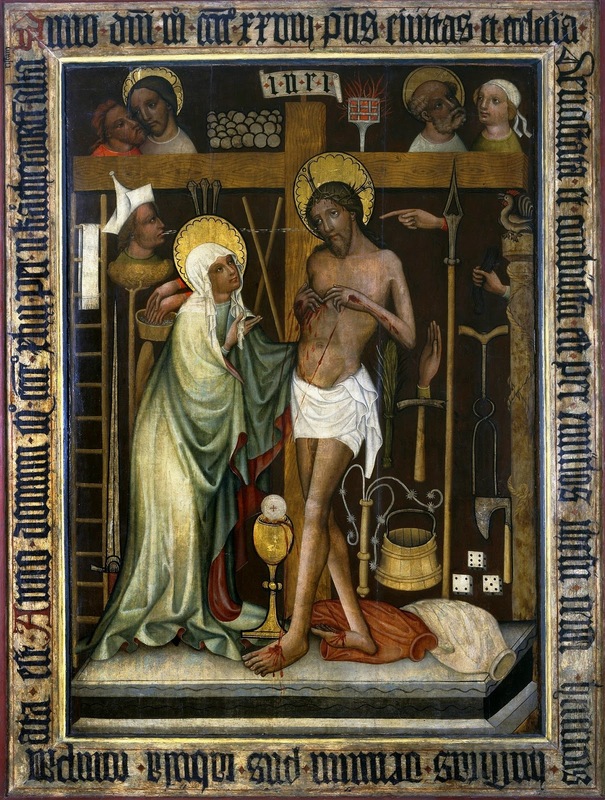 The current use at the Alleluia reflects changes made in our liturgy at the time of Humbert of Romans’ reforms in 1256. 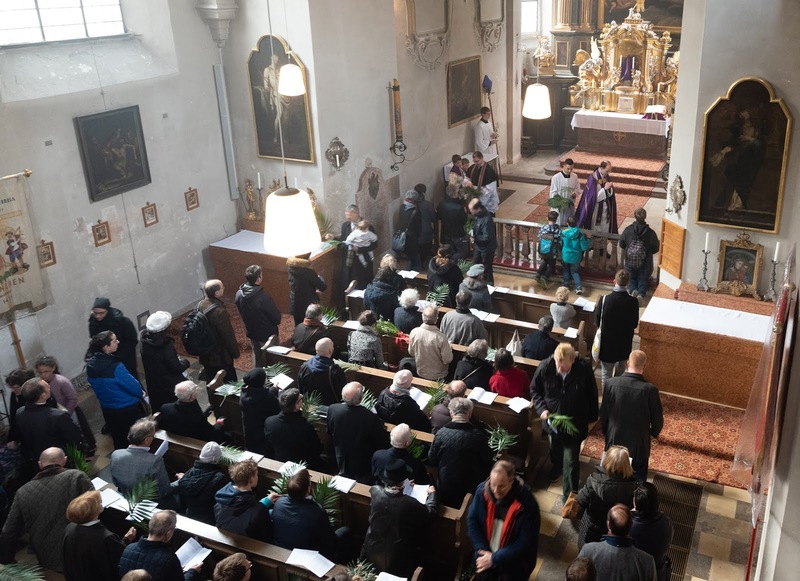 In the picture to the right you can see one of the four extant Dominican Missals from before this reform, representing a standardization of Dominican practice known as “the Liturgy of the Four Friars”, which was approved in 1246. The left page shows the end of the Litany and the Vigil Mass of Easter (the right page is the Mass of Christmas). If you look carefully you can see where the rubrics for the Alleluia have been changed to conform to Humbert’s revision: originally the Alleluia was sung a third time after the verse. This is here crossed out. The Tract was then sung in medio with two pairs of friars alternating the verses. 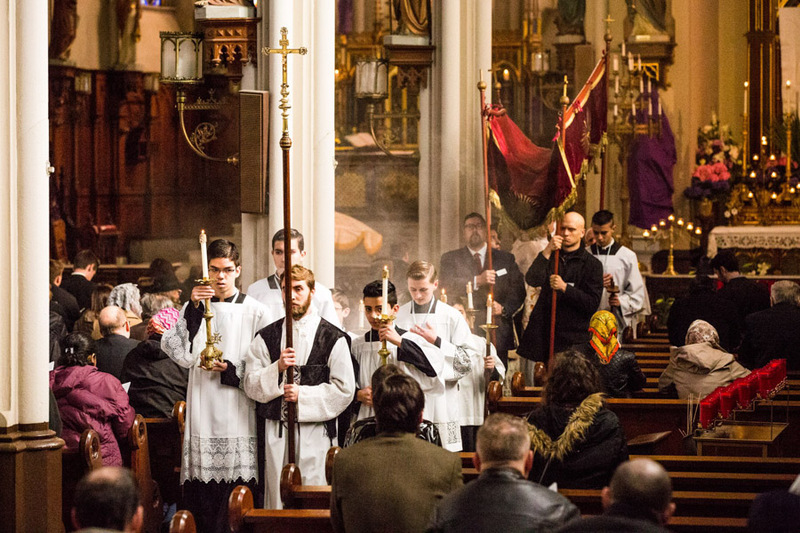 At the Gospel only incense was used; no candles or cross were carried. There was no Credo and no Offertory chant. There was no General Communion of the friars at the vigil because the Easter General Communion was at the Mass of Easter itself. 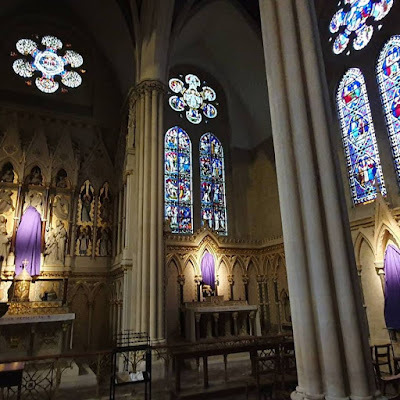 However, I understand that in many places, a General Communion had been introduced into the vigil in the early part of the twentieth century; such was the practice at our House of Studies in the early 1950s. 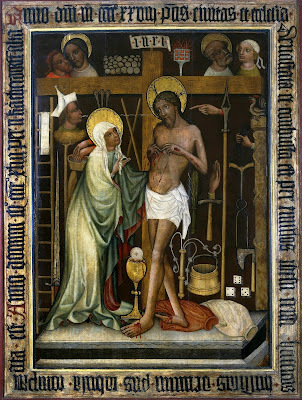 Perhaps the most interesting aspect of the Dominican Vigil is the absence of any rites related to Baptism and the font. This reflects the monastic origins of our rite: monasteries did not have pastoral cures and so had no baptismal font since they never needed to perform baptisms. The rite is also of interest for the simplicity of the fire ceremony, which is probably quite ancient. 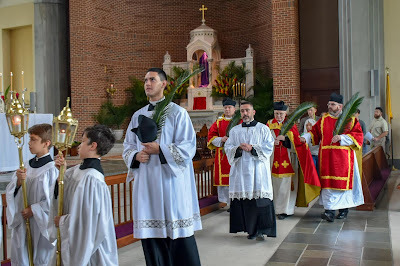 Once again, the response to our request for photos of your Palm Sunday liturgies has been pretty remarkable, and we will definitely have at least three posts this year. 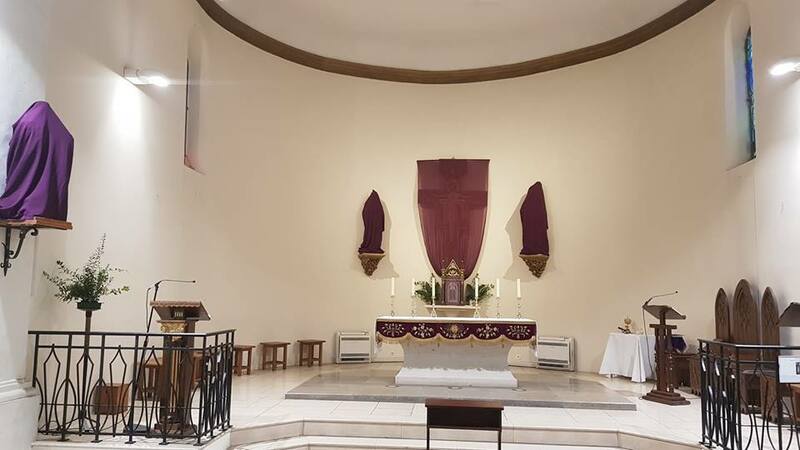 We have quite a mix of things right off the bat, and are very pleased to be able to show the various forms of the ceremony currently in use, a magnificant expression of our rich Catholic liturgical heritage. We will have a lot more of the same variety in the days to come! 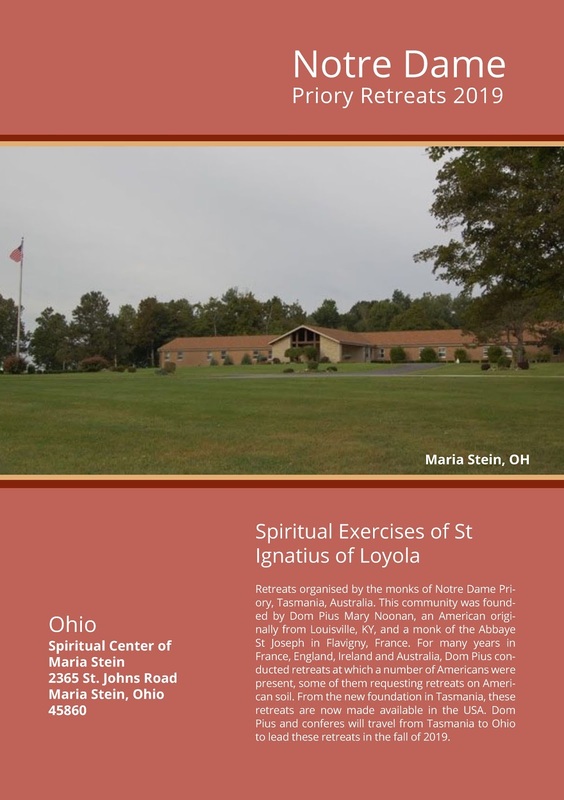 For those who are interested, we discuss all of these issues that modern sacred artists face in the courses of the Master of Sacred Arts program at www.Pontifex.University. This is a theoretical program which is intended as a formation for artists in any creative discipline, patrons of the arts, and those who wish to contribute to the New Evangelization. 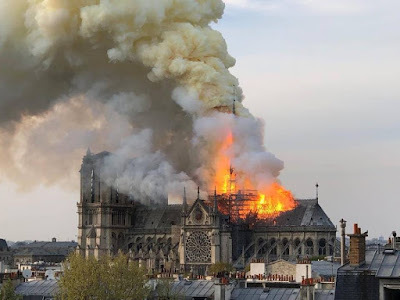 As I am sure all of our readers have already seen, the cathedral of Notre Dame de Paris has been severely damaged by a fire, which as of this writing is still burning; the wooden parts of the church, including the roof and spire, have collapsed. Nothing has been stated thus far as to the origin of the fire; there has been a wave of church vandalism episodes in France in the last few weeks, but the church was also undergoing a major restoration, and there have been many occasions on which disastrous fires broke out during restoration works. 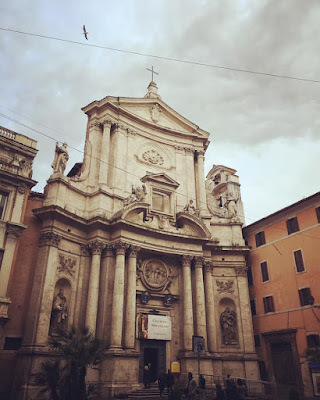 (The ancient Roman basilica of St Paul Outside-the-Walls was destroyed by fire in July of 1823, which began when workmen left a candle burning in the rafters.) 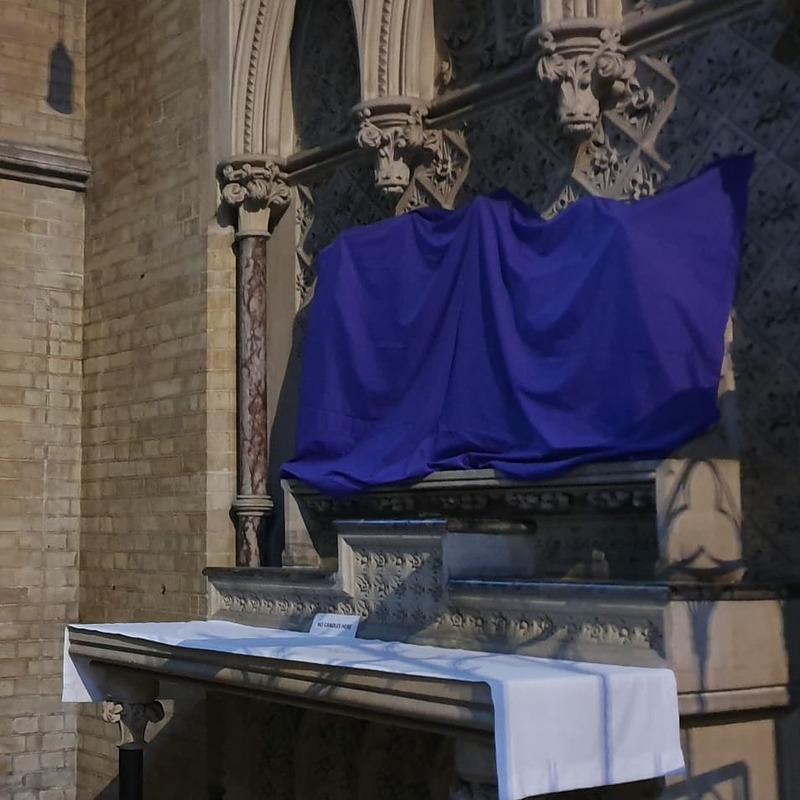 We join all the Catholics of the world in praying for the church in Paris, and the preservation of whatever can be saved from the building; the relics of the Crown of Thorns acquired by St Louis IX, e.g. are kept there. We also pray for the safety of the firefighters, several hundred of whom are on the scene. En union de prière avec tous nous amis de la Schola Sainte-Cécile, et tous les catholiques de Paris. UPDATE: One firefighter was seriously injured, but thus far, there has been no loss of human life. 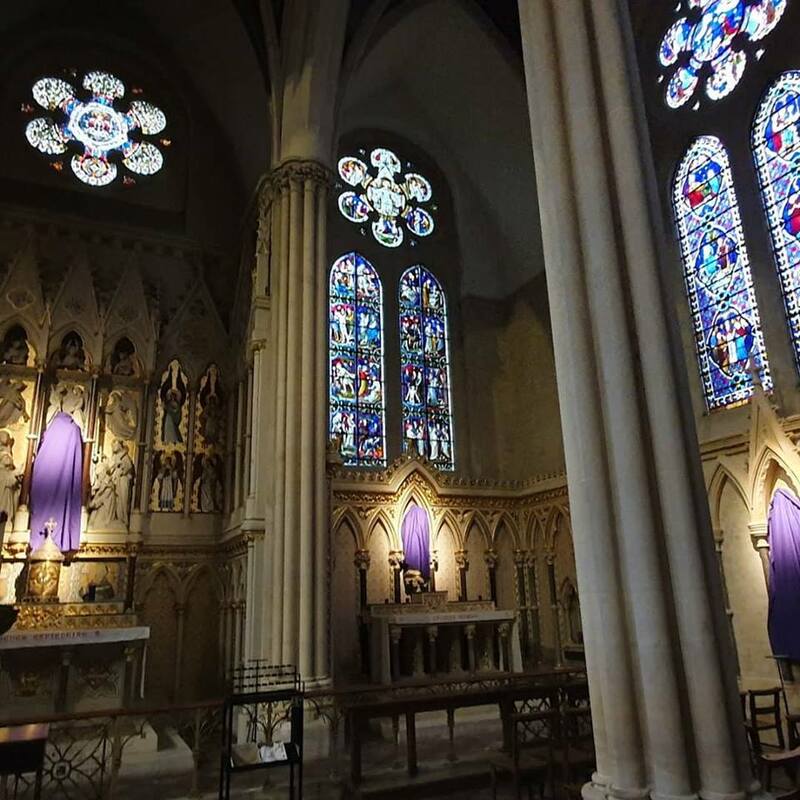 There have now been several confirmations of the report that the Crown of Thorns, St Louis’ tunic, and several other major relics were indeed rescued. There have also been several reports that the main structure of the church will apparently be salvaged. Sancte Dionysi, ora pro nobis! 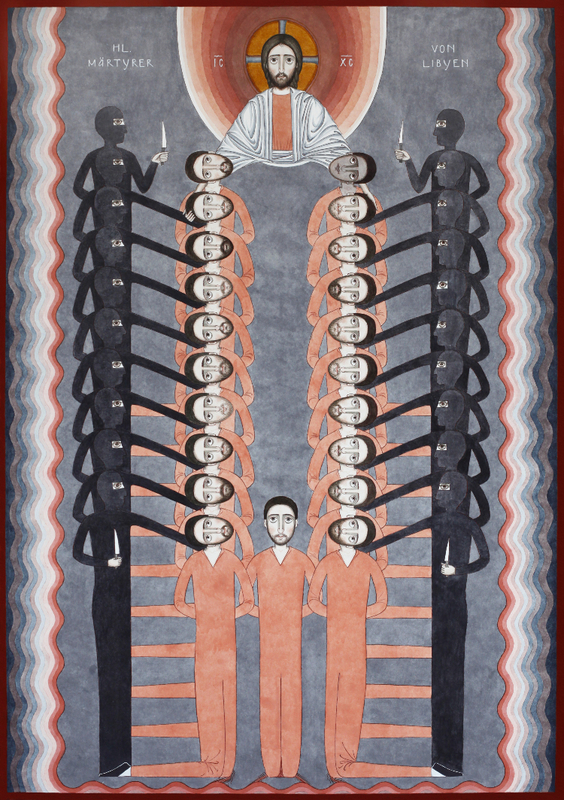 Sancta Genovefa, ora pro nobis! UPDATE: A friend sent me the link to this very moving video of people (mostly pretty young, it seems) singing the Ave Maria in French, in sight of the burning cathedral, on the other side of the Seine. As the Lord entered the holy city, the children of the Hebrews, declaring the resurrection of life, * with palm branches, cried out, Hosanna in the highest. V. When the people heard that Jesus was coming to Jerusalem, they went forth to meet Him; * with palm branches, they cried out: Hosanna in the highest. 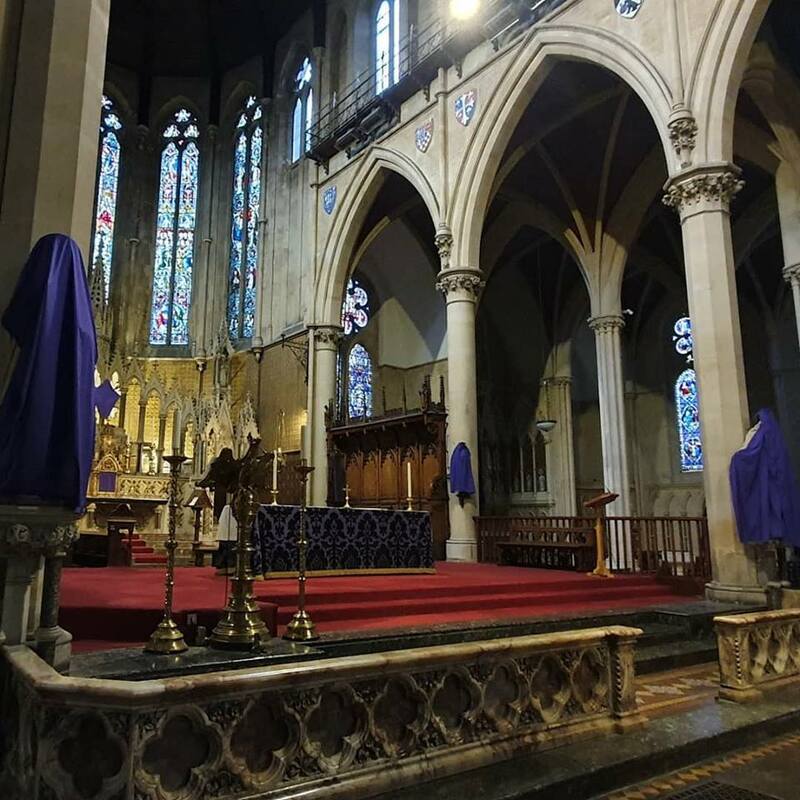 We are not quite finished with our photos of Passiontide veils (another set will be posted shortly), and Holy Week is already upon us! 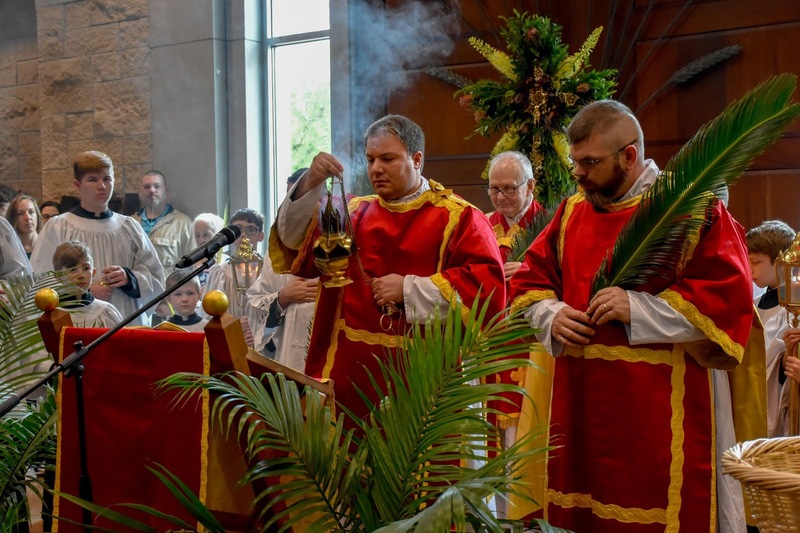 Please send photos of your Palm Sunday services, whether in the OF or EF, Ordinariate or any Eastern Rite, etc., to photopost@newliturgicalmovement.org; don’t forget to include the name and location of the church, and any other information you think important. 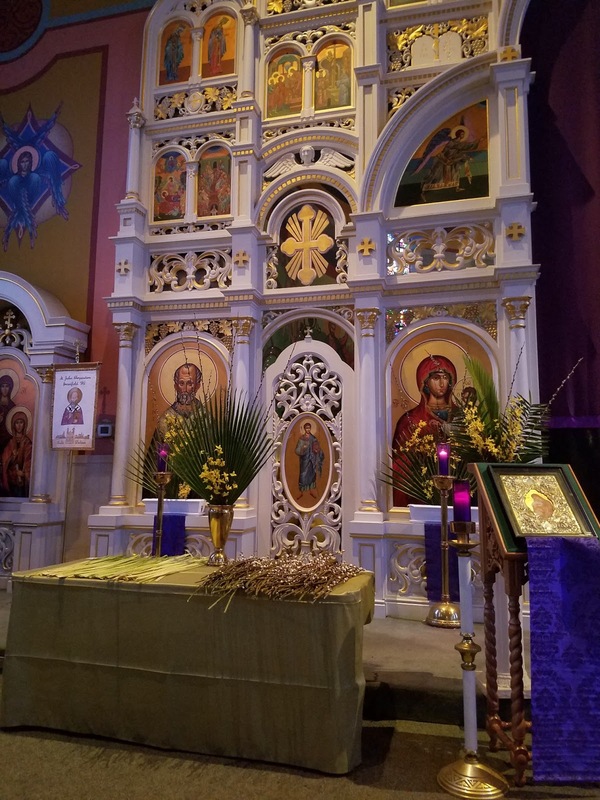 From our first Palm Sunday photopost of last year: palms prepared for blessing at St John Chrysostom Byzantine Catholic Church in Pittsburgh, Pennsylvania. From the second post: knocking on the church door with the processional cross at the Damenstiftkirche in Munich, Germany (FSSP). 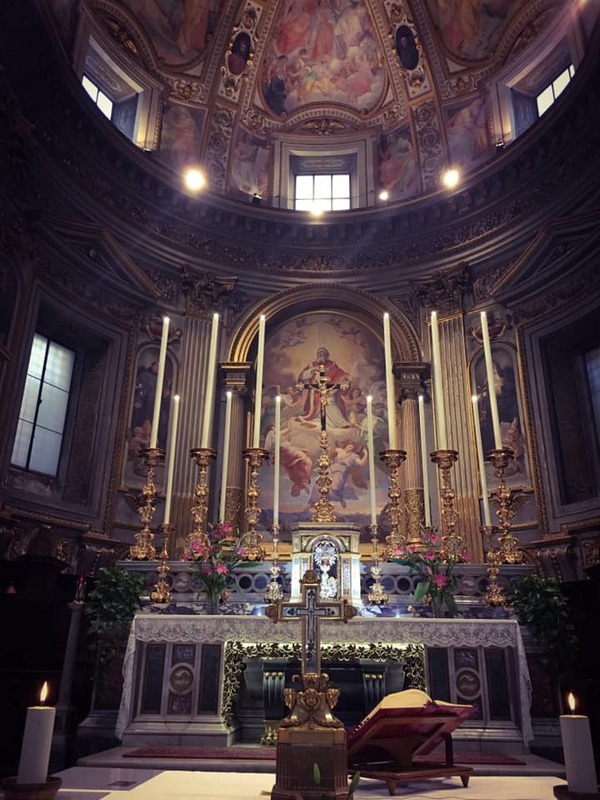 From the third post: a perfect shot of the swing of the Ambrosian coverless thurible, from the church of Santa Maria della Consolazione in Milan, Italy. From the fourth post: palms decorated with flowers for the procession at the Chapelle Saint-Augustin in Lausanne, Switzerland (FSSP).